British official Air Ministry photograph. Approximately 20 x 26cm. Shows a Hurricane bomber in flight with the bombs neatly fitted to the streamlined racks. 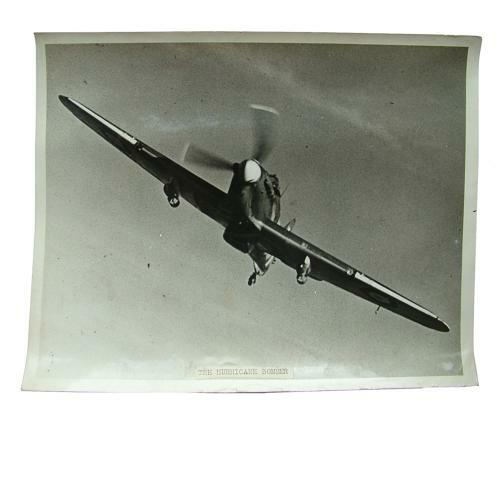 Captioned to rear 'To increase the power of the RAF fighter force in low level attacks on shipping and ground targets, Hawker Hurricanes are now equipped to carry bombs, fitted with delayed action fuses to enable the aircraft to get clear before the explosions when bombing from low level...' Captioned front and rear. Good condition. Stock code P22873-76.